Apple has just released a snappy sequel to its first iteration of iOS 5, citing bug fixes and general housekeeping as the main reasoning behind the necessary update, entitled iOS 5.0.1. 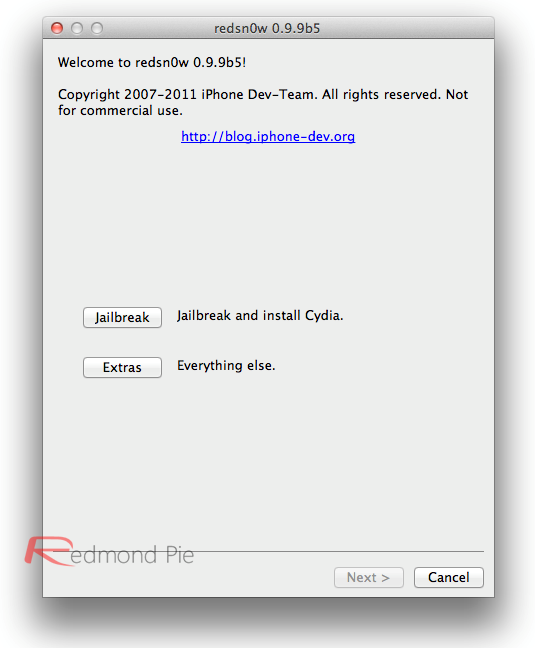 Those looking to enjoy some of the many thousands of jailbreak tweaks and mods on iOS 5 need look no further than Redsn0w, the ever-reliable tool released by the iPhone Dev-Team almost in conjunction with every software update the Cupertino company cares to throw out. We have tested it and can confirm that the current latest version of Redsn0w for both Windows and Mac works with the just seeded iOS 5.0.1 build. Below is the complete step-by-step to jailbreak iOS 5.0.1 on iPhone, iPod touch. The jailbreak doesn’t currently work on the iPad 2 nor the brand new iPhone 4S. If you’re reliant on a Gevey SIM software unlock, then jump to the "For Unlockers Only" part of this tutorial towards the bottom. This is a tethered jailbreak, so whenever you need/feel compelled to reboot your iDevice, you will have to connect it to a PC or Mac running Redsn0w in order to jump-start it. Finally, please consider that if and when the untethered jailbreak appears, you will have to start a fresh – you will not be able to simply ‘upgrade’ your jailbreak as it were. So, hopefully you’re clear on the above, so let’s get jailbreaking! Step 1: Download the latest version of iTunes (10.5) for Windows or Mac. Step 2: Connect your iOS device to your PC or Mac and backup everything up. Although it’s a simple process, always better to be safe than sorry. Step 3: Update to software version 5.0.1 Beta; download links of which can be legally found on iOS Dev Center only. Step 4: Grab the latest version of Redsn0w, depending on your operating system, for Windows or Mac. Step 5: Start Redsn0w. Click on “Extras”, and then click on “Select IPSW” option to manually select iOS 5.0.1 beta firmware for your device. Step 6: Now go back, and click on "Jailbreak", and opt to "Install Cydia". You will then be led through a sequence to place your device into DFU mode. 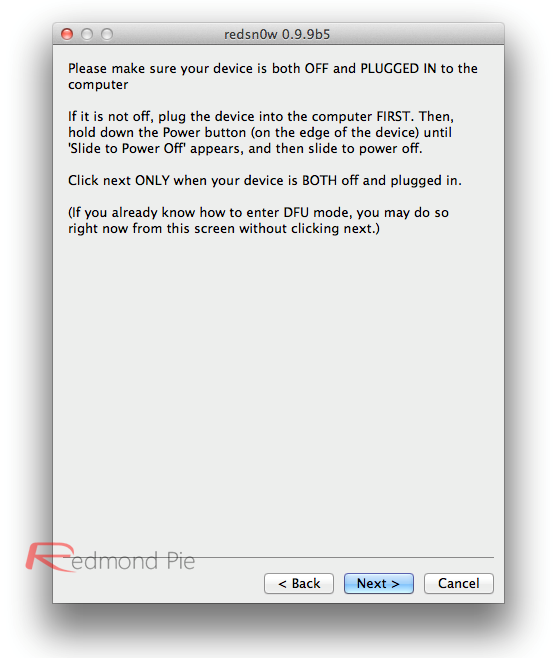 Once your device has achieved DFU mode, Redsn0w will apply the jailbreak. Step 7: Once the Cydia installation is complete, you will need to boot the device into a tethered state in order for the jailbreak to work – something you will indeed be required to do every time you reboot. Enter DFU mode, and in "Extras", select "Just Boot". This video was shot when iOS 5 GM was released. The procedure for jailbreaking iOS 5.0.1 is exactly similar to last month’s GM release. Optionally, if an unstable jailbreak of sorts doesn’t bother you much, you can use SemiTether jailbreak package from Cydia which is second best thing to an untethered jailbreak. Details on semi-tethered 5.0.1 jailbreak can be found here. If you’re using a Gevey SIM to unlock your device, you should NOT update to the stock firmware file offered via iTunes. You will need to create a custom IPSW in order to preserve your baseband. The whole process can be performed in Redsn0w, and is simple enough to execute. Click on "Extras", then "Custom IPSW", locate the required IPSW firmware file for your device, and Redsn0w will cook up your very own custom firmware file. Once complete, enter Pwned DFU mode ("Extras", "Pwned DFU") and then restore using your custom firmware through iTunes. After that, with your baseband intact, you’ll happily be able to unlock your iPhone using a Gevey SIM. We keenly await news of a possible untethered jailbreak on iOS 5. There have been a couple of hints from experience members of the jailbreaking sphere, such as MuscleNerd, P0sixninja and i0n1c. You guys will be amongst the first to know if and when an untethered solution does surface, for all devices including iPhone 4S and iPad 2, along with all the details as usual- so stay tuned for more! UPDATE: Redsn0w 0.9.9b8 has been released to support iOS 5.0.1 firmware files. The above guide has been update to reflect this change.